The greatest influence on my music comes from Mary Greene. Mary lives on the outskirts of Boone, North Carolina, and is a very accomplished musician. She plays a variety of instruments, but primarily focuses on the acoustic guitar and mountain dulcimer. I met Mary in 1990 after moving up to Wisconsin for a year. While in Wisconsin, I got homesick for the mountains and began to absorb myself in Appalachian culture as best I could in the mid-west. After moving back to western NC, I finished off an old mountain dulcimer kit my father had, and in the local paper found an advertisement for a dulcimer class at the Appalachian Cultural Museum. Mary Greene was the teacher, and the educational director of the museum. Mary can read people very while, and although I did not know what my potential was, she did. She got me started in music, and also in the field of museums. Without Mary I would not have met the other people on this list. 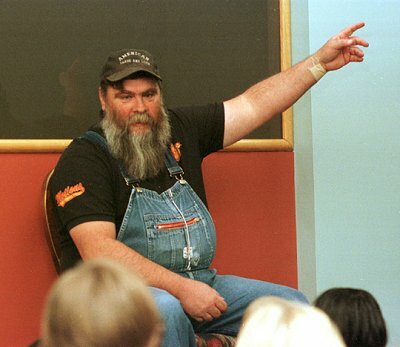 Ray was probably our nation's best known storyteller, and has been the influence of many of today's tellers. He was born on Beech Mountain, North Carolina in 1922. His family came from a long line of storytellers specializing in the Jack Tale. Ray was an interesting storyteller, in that while another storyteller might take fifteen minutes to tell a Jack tale, Ray would take twice as long. If during the story Jack goes to the grist mills to get some corn ground, Ray would start telling about his own experiences working in grist mills, and he would eventually weave himself back into the story, teaching you a lot about Appalachian culture and history. Ray, his wife Rosie, and youngest son Ted, lived in a house that Ray's grandfather built. They did not have a telephone or running water, and they got electricity in the 1980s, with which they ran a refrigerator and a small lamp. Everyone around them had all of the conveniences of modern life, but Ray never saw the need for it. Ray passed away on Easter Sunday 2003 after a long bout with cancer. 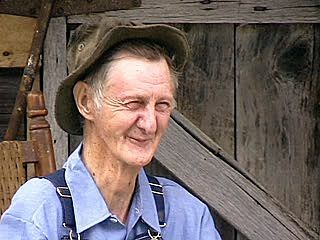 Orville learned traditional mountain tales from his mother, Sarah, and from from Ray Hicks, when he and his brothers would go to Ray's house to get their hair cut. One of seven siblings, Orville's mother would entertain them with a traditional tale or two every night. Although Orville was a very shy boy, Ray encouraged him to tell stories, and Orville is now the top storytelling in the region, telling his tales at schools, festivals, and museums in the area. Orville works at the recycling center on US Hwy 321 between Boone and Blowing Rock, North Carolina every Monday, Wednesday, Friday, and Saturday. I encourage anyone visiting the area to stop by and see Orville. You will not regret it, and please tell him that John sent you. Although you may have not heard the name, you know a song that Frank's father introduced to the Kingston Trio folkgroup that they took to the top of the charts, Tom Dooley. The version you hear on the radio is very commercialized and the traditional version they learned from Frank Sr. is very different. 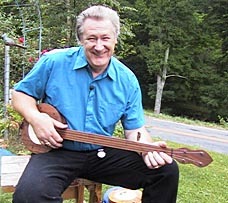 Frank Jr carries on this father's love of traditional Appalachia music on this fretless banjo and mountain dulcimer. A very accomplished musician, Frank is very modest when he tells you he has placed at such places as the Beaver Creek fire department, various festivals around Watauga county, and Carnegie Hall in New York City. Frank passed away of a heart attack on August 7, 2005.